High Performance Pure Protein Ideal for Gaining Muscle and Weight Control! 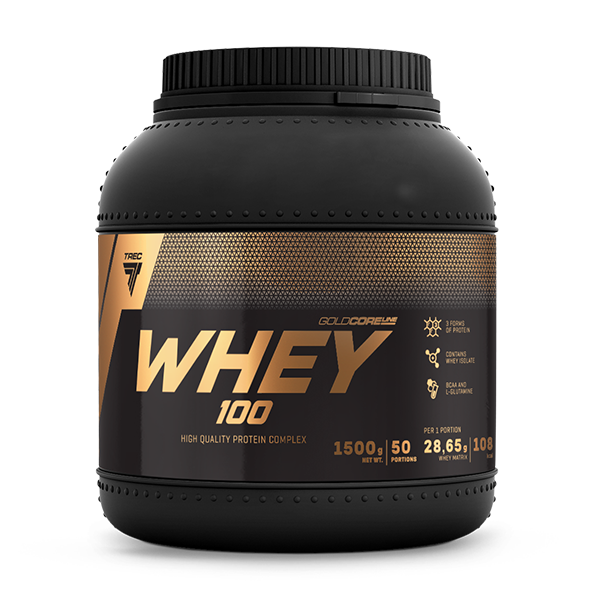 GOLD CORE LINE WHEY 100 contains complex of whey protein concentrate, isolate and hydrolysate. The product is an source of full-value animal proteins, rich in all essential amino acids including BCAA and L-glutamine. GOLD CORE LINE WHEY 100 dissolves extremely well. Proteins it contains helps to increase and maintain muscle mass. Recommended daily portion is 90 g.
Available flavours: Advocat, Chocolate, Strawberry, Vanilla, Banana, Cookies, Raspberry, Cherry-Chocolate, Chocolate-Coconut, Chocolate-Sesame, Peanut Butter. Dissolve one portion of the product – 30 g (2 scoops) in 200 ml of water or milk; use a shaker or a blender. Take 3 servings daily. On workout days: 1st serving in the morning after getting up, 2nd serving within 1,5 hours of workout, 3rd serving at bedtime. On non-workout days: 1st serving in the morning after getting up, 2nd serving between meals, 3rd serving at bedtime. WARNINGS: Do not exceed the recommended daily dose. Do not use the product as a substitute for a varied diet. Children, pregnant or nursing woman must not take the product. Varied and balanced diet and a healthy lifestyle are important. Azorubine may have an adverse effect on activity and attention in children. The product may contain allergens such as: milk, soy, wheat, barley, oats, eggs, peanuts and nuts. STORAGE: Keep this packaging tightly closed in a dry place, at the temperature of 15–25°C. Keep out of the reach of children. BEST BEFORE END, BATCH NUMBER, COUNTRY OF ORIGIN: See the side of the packaging and weld. INGREDIENTS: GOLD CORE WHEY MATRIX [whey protein concentrate (from milk); whey protein isolate (from milk); whey protein hydrolysate (from milk) (95,5%)]; cacao powder for the chocolate, chocolate-cherry, chocolate-sesame, coconut-chocolate; aromas; acidity regulators for the strawberry and raspberry flavour – citric acid, malic acid; thickeners – cellulose gum, xanthan gum; sweetener – sucralose; colour for the vanilla, cookies, peanut butter and advocaat flavours – beta-carotene; colour for the banana flavour – quinoline yellow; colour for the strawberry and raspberry flavours – cochineal red A.